A strand of graduated boulder beads approx 7mm - 12mm range, 41 beads in the strand. Approximately 41cm long. 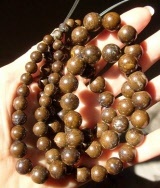 Beads weigh approx 68 grams. Temporarily strung. There is NO sparkle in the beads. Stock available, later on in the year.